Struggling to make do with all those 2GB USB thumb drives you've hoarded over the years? Then it's time to upgrade portable storage with one of two readily-available options; pick up an external hard disk for copious amounts of storage at minimal cost; or pay the premium for a noticeably quicker external solid-state drive. We're staunch advocates of taking the latter route - SSDs are not only fast, they are also quiet and typically more resilient to shock or other adverse conditions - plus price is no longer prohibitive. Hoping that consumers are ready to make the transition from mechanical to solid-state, Seagate has been busy updating its product line with a range of modern SSDs. One of the latest additions is the aptly-named Fast SSD. 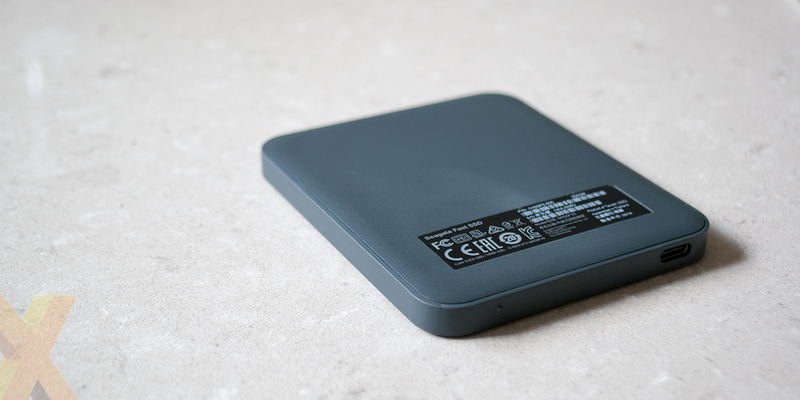 Available in 250GB (£90), 500GB (£125), 1TB (£290) and 2TB (£540) capacities, this portable drive is sleek, stylish and, as it says on the tin, suitably fast. Dimensions of 94mm x 79mm x 9mm are small enough to slip into a pocket, while weight is kept to just 82g, however it isn't quite as petite as the rival WD My Passport SSD, so that's something to bear in mind if absolute portability is the main priority. We quite like the Fast SSD form factor - Seagate's drive is just big enough not to be lost easily - and the construction quality feels top notch, with a thin sheet of aluminium draped across the top of the plastic shell. There are neither squeaks nor rattles to the soft-touch main body, the rounded edges and mirrored Seagate logo are elegant, a two-tone grey finish is both modern and trendy, and we imagine it's only a matter of time until special edition colour variants become available. There's no water-proofing, so those seeking a truly rugged solution need to look elsewhere, yet Seagate's drive ought to be able to withstand the occasional drop, and there's also the peace of mind of a three-year warranty. There are no surprises when it comes to connectivity, with the Fast SSD employing a single USB 3.1 Type-C port positioned in the bottom corner. A small white status LED is present on the opposite end, and Seagate covers all bases by including both Type-C and Type-C to Type-A cables as part of the bundle. The bundle is otherwise sparse, though purchasers do get access to a free download of Seagate Toolkit - a lightweight backup and folder-mirroring app - as well as a two-month trial of an Adobe Creative Cloud Photography Plan. It's a simple-enough package that is pre-formatted to exFAT for compatibility with both Mac and PC, and the Fast SSD need only perform well to live up to its name. 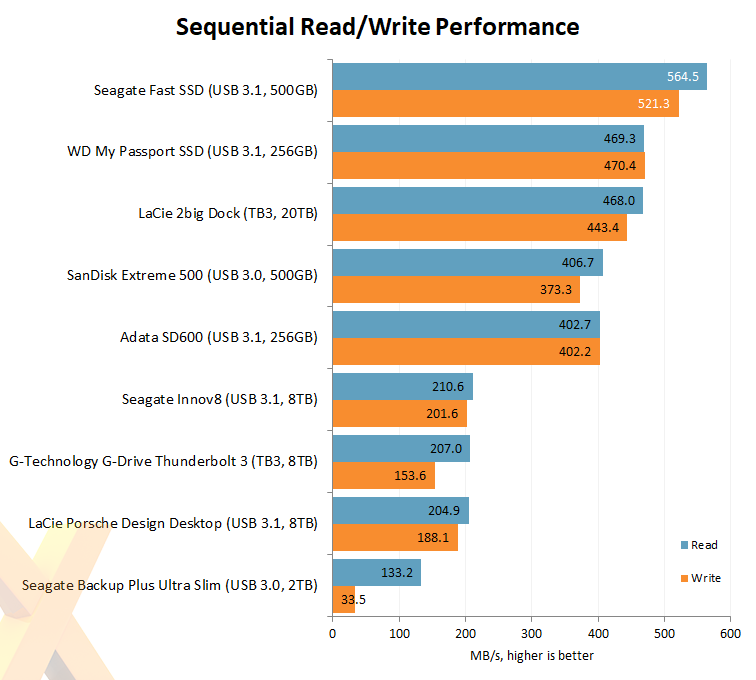 Seagate officially quotes sequential read and write speeds of up to 540MB/s and 500MB/s, respectively. Our 500GB review sample, attached to our Core i7-8700K test platform via the supplied 500mm Type-C cable, managed to better those expectations, hitting highs of 565MB/s.